UVic BSEng and CompSci students redesigning a website using HCI techniques in SENG 310. 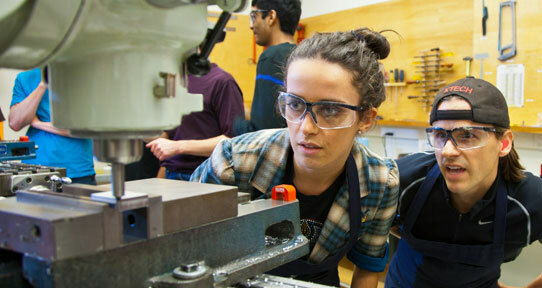 Undergraduate students working in mechanical engineering department machine shop. BME 201 Quantitative Human Physiology — Study of cardiac system, respiratory and pulmonary system, neuro-muscular, endocrine and renal systems. Tiffany Yu conducts equipment testing while on a co-op work term with Teck Highland Valley Copper. Design projects such as the robot shown here are part of the undergraduate program, starting in the first year. Whether you're new to UVic or want to know how you can get more involved, we're here to help. If you need help selecting courses, check out our program planning documents. Our academic advisors can help you understand program requirements, adjust your course load, and answer any academic or resource questions you might have. Learn more about the co-op process and get career advice.